Content Curation vs Content Creation – Which is Better for Marketing? Content Curation vs Content Creation – Which is Better? 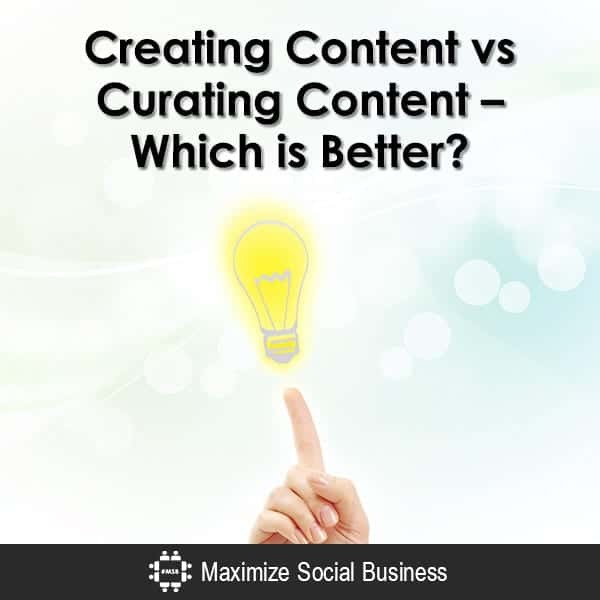 Which is the better way to go: Content curation or content creation? After all, there are many different buyers in many different phases of the customer lifecycle. The key to capturing their interest is to provide content that hooks their attention, lets them know you are an expert in providing solutions to their problems, and brings them further into the buying cycle. There are tons of kinds of content but only so many hours in a day to develop all those pieces. You could be creating all that content – or you could be using content curation to curate it. But which is more effective? Creating content is all about developing unique pieces that showcase your business’ expertise. When you create your own content, you show your audience that you know how to think through the issues your prospects are experiencing and provide them with the answers. You have the opportunity to state your point of view. Prospects can then see if their viewpoint matches yours. You can tailor your content to support the solutions you offer. People then get a clearer idea of why they should choose what you have to offer over any of your competitors. Branding – Develop a look, feel, and voice that is all your own. Explaining – Give people a window into how your products or solutions work and your competitive differentiators. 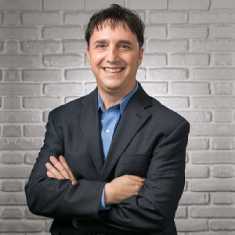 Growing Thought Leadership – Creating content lets you build your status as a thought leader. Even better, you can showcase the strengths of employees across your company by having them author pieces (blog posts, Quora answers, SlideShare, etc.). Bringing Traffic – If the content you are creating is strong, people will come to your web properties to check out other things you have to say. In addition, people will share your content, increasing your audience reach. Driving Purchases – Assuming your visitors like what you have to say, they will be more likely to do business with you. Time-Consuming – This is the biggest negative of creating content. It takes a lot of time and effort to create valuable content in a variety of formats. This issue is exacerbated if you have a small marketing team. Expensive – If you have to bring in an outside vendor for content development, layout, and/or social media promotion, things can quickly get pricey. Evernote – Evernote enables you to take notes and organize them in a way that makes sense. You can write down ideas as you get them, outline articles, and quickly search and/or access information when you’re ready to put your content pieces together. Google Docs – Google Docs allows you to easily share and collaborate on documents. If your content needs to be reviewed by a number of people, Google Docs allows you to ensure that everyone is working on the most up-to-date version. Canva – Canva is a great way to save on graphic design costs. If you want to create slides, infographics, beautiful social media posts, and more, this is the place to go. In addition, the paid version of the tool allows you to quickly brand your content or switch formats so a graphic can easily be reused across multiple social media channels. Curating content is all about uncovering content that other people have created and bringing that content into a single stream for others to peruse. No one has the time or ability to cover every angle on any issue. Curating content gives you the ability to cover a much broader set of topics than you would be able to cover on your own. In addition, curating content provides you with the opportunity to connect with other thought leaders in your space. It also shows you are up-to-date with the latest trends, research, and concepts, even if you didn’t develop them yourself. Saving Time – Supplementing your content with someone else’s content allows you to provide your audience with more valuable information than you would have been able to create on your own. Developing Relationships – Sharing someone else’s content gives you an opportunity to strengthen the connection between your business and that person. This is especially of key importance when you are working with a media persona, analyst, or influencer. Amplifying Your Voice – Often when you share someone else’s content, the author will thank you and/or repost your post. The author might even check out other content pieces that you created and share them as well. Loss of Traffic – When you share a link to someone else’s site, you are sending your traffic to a piece of real estate that you don’t own. Time-Consuming – It can be time-consuming to curate appropriate articles. Even though there are tools to help you find appropriate pieces to share (for example, Buffer and HootSuite offer the capability to easily view a broad range of articles on a particular topic), you should always click through the links. At least scan the articles you’re provided with to ensure that they truly contain information you want to be associated with your brand. Loss of Trust – Make sure that you fully trust your sources. If you link to untrustworthy sources, your audience will stop trusting you. Illegal – You don’t have to worry about sharing a social media post that includes a quote from someone else’s piece of content. However, do not create a blog post or any content that directly rips large amounts of information from the original article unless you have the appropriate permissions. Otherwise, it’s plagiarism. For some great tips on how to properly curate content, check out this article: Content Curation: Copyright, Ethics & Fair Use. Curata – Curata will help you more effectively gather and use curated content, as well as create content with contributors across your entire team. Flipboard – Flipboard enables you to take curated content and create a mini publication on the topic of your choice. Pocket – Pocket allows you to save content in a single place whenever you find it and then use it at a future date. Both content creation and content curation are worthwhile pursuits. Your content marketing efforts will work best if you combine the two. You can even merge the 2 by aggregating content from a variety of sources and adding your own commentary so as to create an entirely new piece. Just be sure to credit the original sources of the information you’re aggregating! That said, if I had to choose between one or the other, I’d choose to create content. While there might be a variety of steps involved in a marketing campaign, ultimately, the purpose of any marketing effort is to close deals. Creating content gives you the opportunity to showcase your strengths and your competitive edge in a branded way. In the end, that will help you reach your goals faster. Whether you are focusing on creating content or curating content, make sure that you include a good mix of different kinds of content. Engage with your audience with words (like eBooks and blog posts), interactive content (like quizzes and polls), and visual content (like live or canned video and infographics). One more thing to remember for both creating content and curating content: this is not a “set it and forget it” process. You have to monitor each piece of content to see how it is performing. If it isn’t performing well, analyze your results and understand what can be done (if anything) to boost performance. If a piece of content is performing well, you should consider how to improve performance (for example, through paid social media advertising, Google AdWords campaigns, etc.). This can potentially result in more ad spend. At the same time, the hope is that you will gain more then you will spend (i.e., your spend will result in more purchases). What have your experiences been with creating content vs curating content? Let me know in the comments below or Tweet me up at @HollyChesman. a great article thank you for reviewing the pros and cons of content curation and creation. Even though this leads to an simple conclusion: you have to manage both. In my eyes content creation is a must for everyone dealing with social media in a professional way, thats a certain expertise you must have. But, content curation is the way to built up a network and socialize with other companies, bloggers etc. and to show your customers, followers etc. that you look outside the box. Hi Holly, I just love Flipboard! I haven’t tried to embed any boards yet but you gave me an idea with this post, thank you! I love to create my own content but I do use curating sites and love gathering great content together. It is such a timely process creating your own content – from the writing to the visuals or videos. But it can be worth it if done regularly! I like the way you have given the pros and cons in this article. I like to create content myself, but sometimes I’ll curate an article here and there. For me personally, it takes less time to create content because there is so much I want to say lol. When it comes to images, Canva is my go to place. I find I can get very creative there. I usually create images for fun in batches at a time and tuck them away in a folder on my laptop.